Supply (room available) increased 0.6%. ADR (average daily rates) increased 3.8%. Demand: "We are currently forecasting room demand to grow about 1.3% during 2012." Supply: "At this time, we are forecasting a modest increase in room supply for 2012 of 0.8%, which should not impact occupancy significantly." RevPAR (Revenue per available room): "With modest gains in occupancy and stronger increases in room rates, we expect RevPAR to increase about 4.3% during 2012." STR expect hotel construction to pickup soon with more deliveries in 2013: "As we enter 2012, room supply barely is keeping pace with room closures, and it could be the beginning of 2013 before we start seeing significant growth in room supply." Since it takes some time to build hotel rooms, it might take until 2014 or later to see "significant growth in room supply". 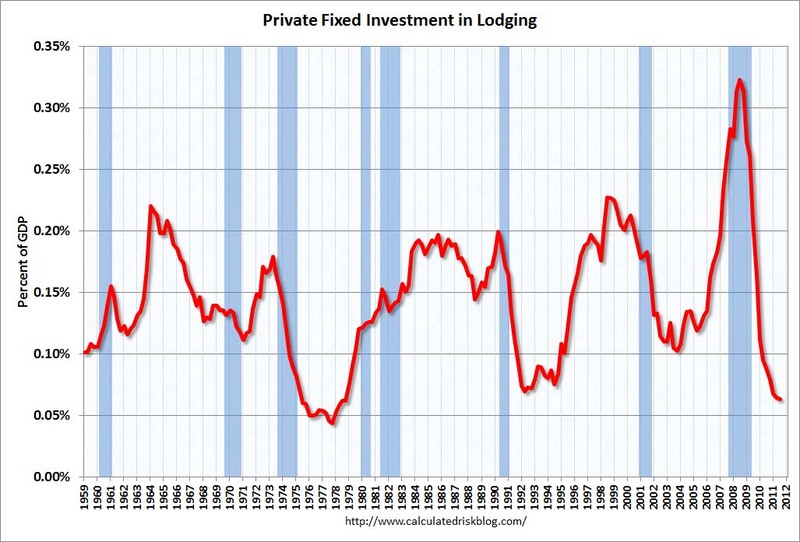 This graph shows investment in lodging as a percent of GDP. 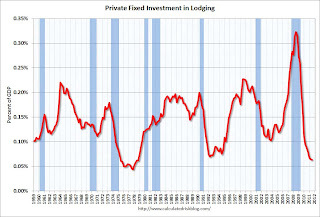 There was a sharp boom in lodging investment during the bubble, and lodging investment peaked at 0.32% of GDP in Q2 2008. However investment has fallen over 80% since then and investment is now near historic lows. With limited supply, increased demand translates to a higher occupancy rate, higher room rates and improved margins for hotels - and eventually more new construction and jobs. Lenders foreclosed on 230 hotels in 2010, up from 138 the year before, Atlas Hospitality Group said in a report.